A black and white negative of a portrait of Miss. 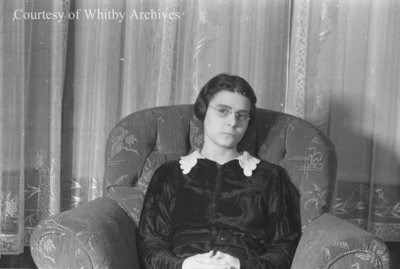 Mutton taken at the Ontario Ladies' College in February 1938. In this view she is facing forward with her head tilted and her hands folded in her lap. Miss. Mutton, February 1938, Marjorie Ruddy. Whitby Archives A2013_040_656C.